Strategies for fostering powerful cultures of innovation and creating breakthroughs. Since the late 1990s, technology markets have declined dramatically. Responding to the changing business climate, companies use strategies of open innovation: acquiring technologies from outside, marketing their technologies to other companies, and outsourcing manufacturing. But open innovation is not enough; it is mainly a way to run a business to its endgame. By itself, open innovation results in razor-thin profits from products that compete as commodities. Businesses also need a path to renewal. No one ever achieved a breakthrough with open innovation. Our capacity for creating breakthroughs depends on a combination of science, imagination, and business; the next great waves of innovation will come from organizations that get this combination right. During periods of rapid economic growth, companies and investors focus on the short term and forget where breakthroughs come from. Without appropriate engagement and reinvestment, the innovation ecology breaks down. Today, universities, technology companies, government funding agencies, venture capitalists, and corporate research laboratories need to foster the conditions in which breakthroughs arise. 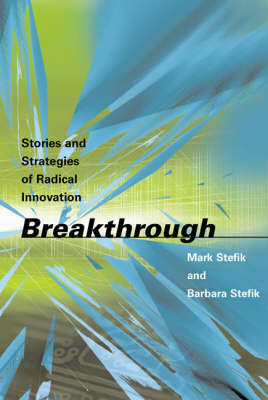 In Breakthrough, Mark and Barbara Stefik show us how innovation works. Drawing on stories from repeat inventors and managers of technology, they uncover the best practices for inventing the future. This book is for readers who want to know how inventors do their work, how people become inventors, and how businesses can create powerful cultures of innovation.